We made three days to return from Spain to Switzerland. The first day has ended in Carcassone. 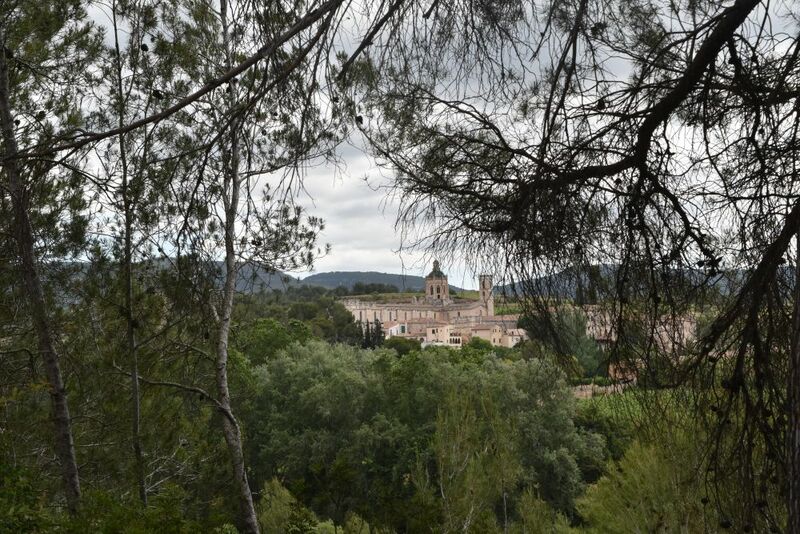 The second day takes us to Albi, to Espalion and to Laguiole, where we spend another night. 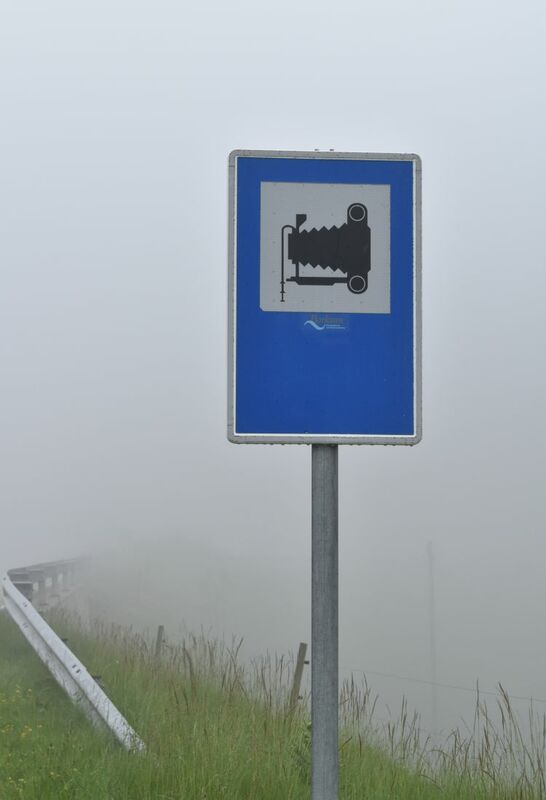 On the third day we just “eat up” kilometers on motorways and enter Switzerland on the Pas de Morgins. 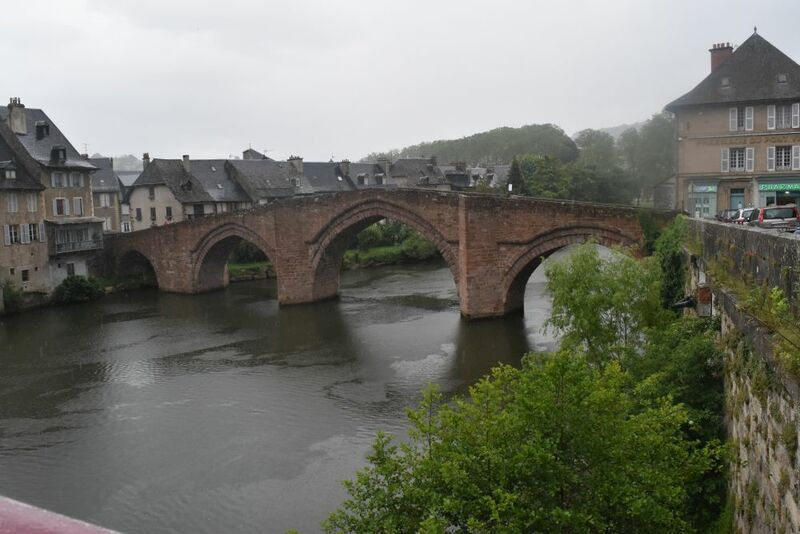 In the pouring rain, we reach Albi located on the river Tarn. 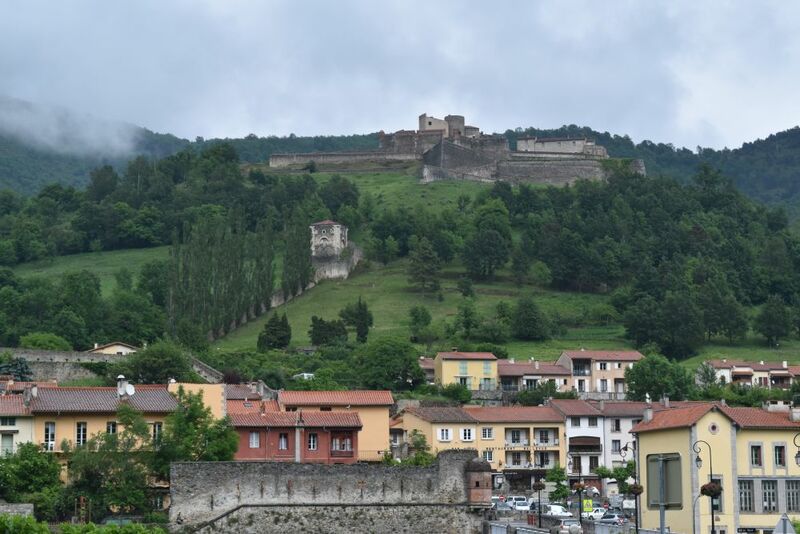 It was an important centre of the Cathars, also called Albigienses. 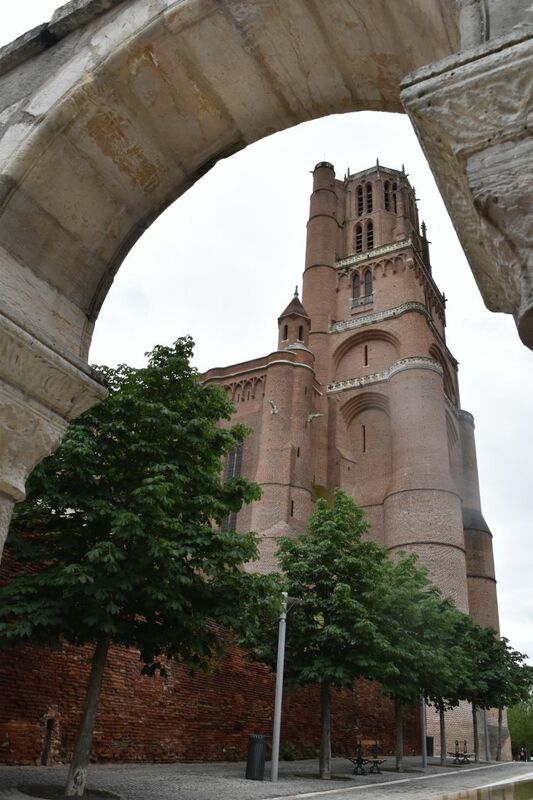 The old city has mostly been built from red bricks and their cathedral Saint Cécile is made of the same material. 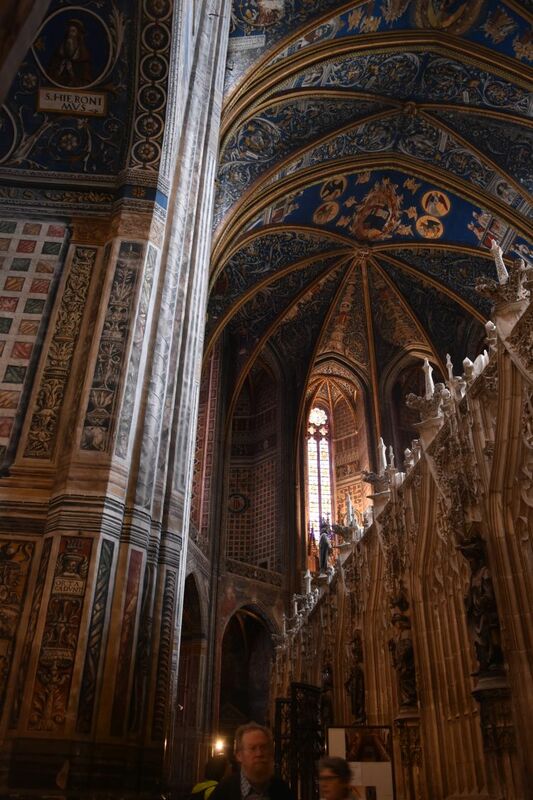 Inside the cathedral is painted in blue which gives it a harmonious atmosphere. In the pouring rain we do not feel like more sightseeing in this charming town and continue north. We continue north through the Causses plateau mountains. It is a rough landscape that the pilgrims to Santiago de Compostela feared – for the wind, for the cold temperatures and also for the robbers. The cities lie in the valleys. Espalion is one of these. The gothic bridge crosses the river Lot. The shoreline of this small town is charming and so are the narrow streets, but the only one hotel in town is booked out. And – it is pouring with rain. We decide to continue to Laguiole. Laguiole is a mountain village located in the Aubrac. The temperatures are now down to 9 degrees – it is chilly, rainy and misty. This is the impression from our evening walk. 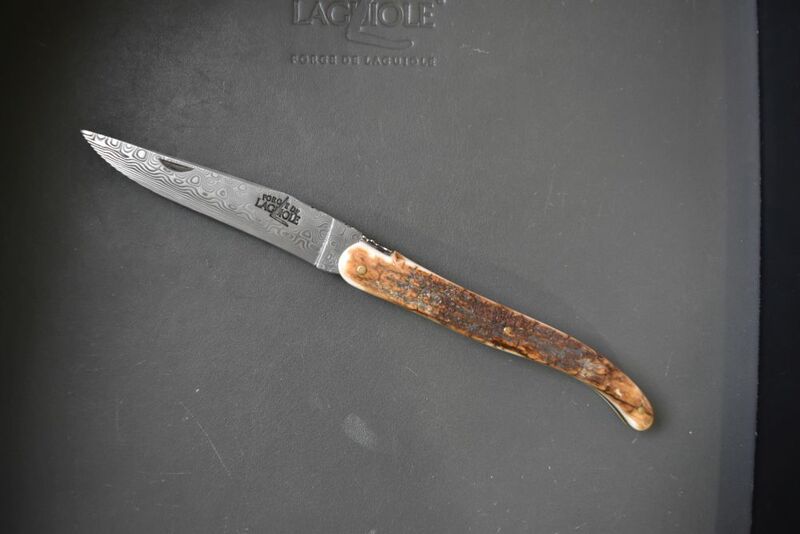 Laguiole is famous for its high quality knives. Their speciality are the foldable knives – this is one of them with a damascene blade. But they also have knives, forks and spoons for the table – beautifully designed by star designers. 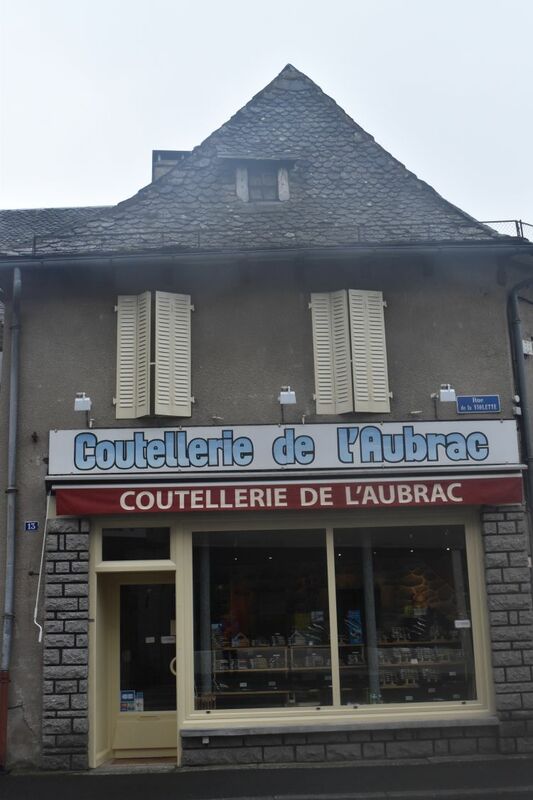 The village is full of knife shops (called “Coutellerie”). Also tours to factories are on offer. In addition the Aubrac and Laguiole are famous for their regional “Aubrac” cattle, a robust species that is used for milk and meat production. The cattle is brown with a dark brown line decorating the border of the ears. This cattle enjoys an excellent diet of mountain herbs and delivers AOC cheese and savoury meat. 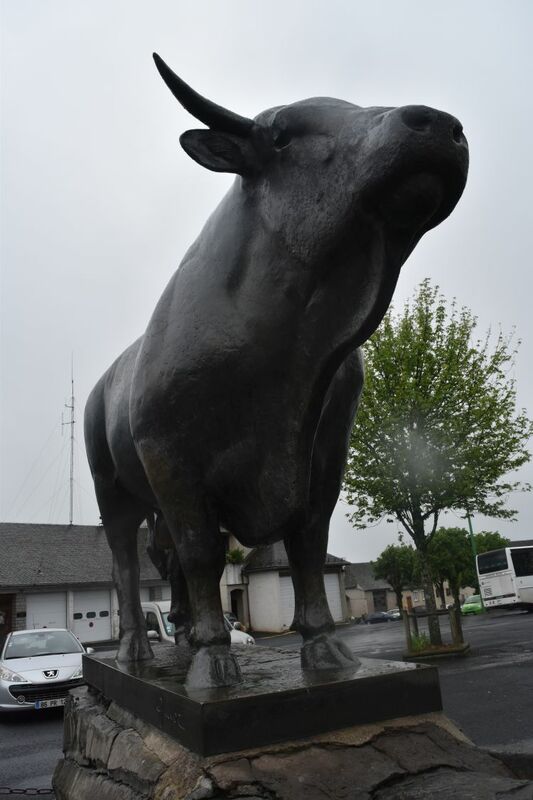 The “Aubrac” cattle is so much valued that it has received a memorial in the village center. 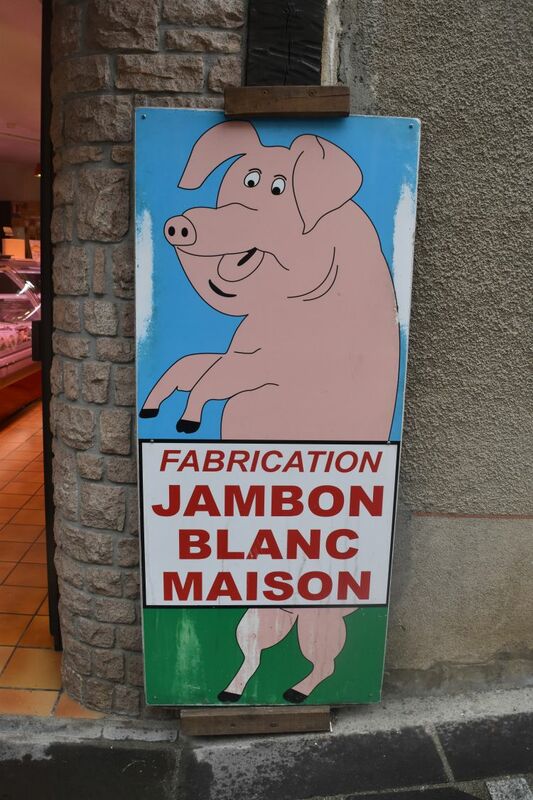 In addition to the products of the Aubrac cows, the butchers also sell white ham and other specialties from pigs. I bought some of their cooked white ham, and enjoyed it, when back home. 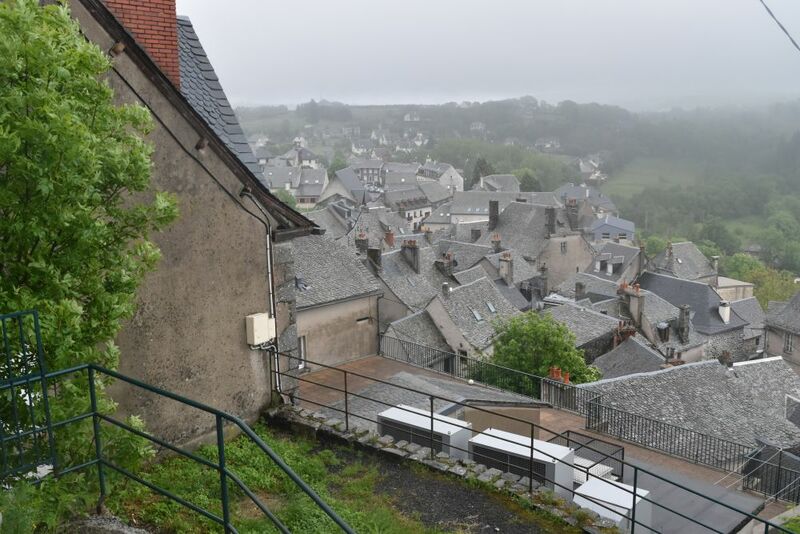 We find a room in the friendly Hotel de l’Aubrac. 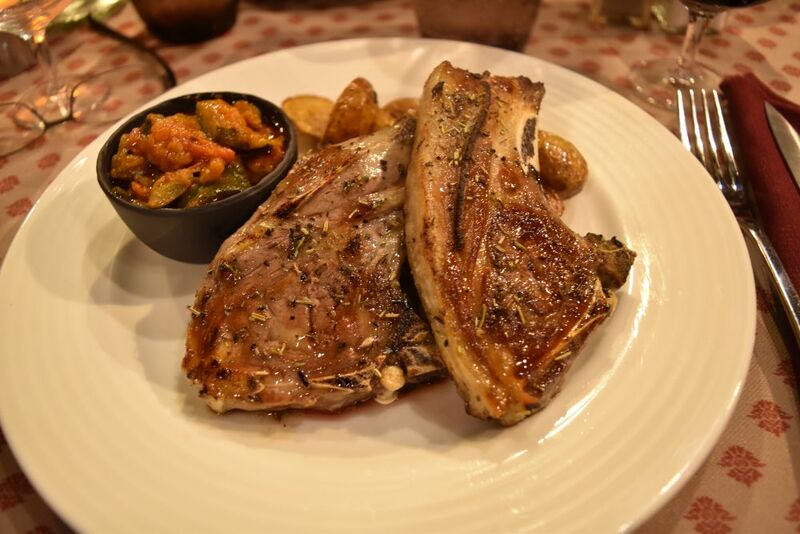 The house is also an excellent restaurant that serves tasty meals from regional products. 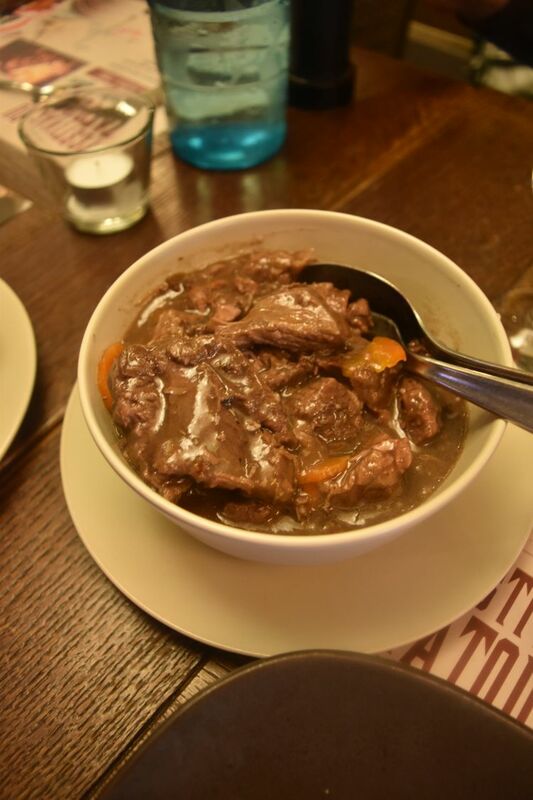 We have a menu – this was my beef bourguignon made in wine and gentian liquor. The people here know, how to make use of their natural products. The meal was authentic and well prepared. The beef was served with Aligot which is potato purée mixed with local cheese which gives it a firm texture. A red wine from Marcillac (some 50km south from Laguiole) was a perfect match with my beef. Ursula liked her pot-au-feu. An excellent choice of local cheese followed as part of the menu: Ecir (cow milk), a regional goat cheese and Roquefort (which originates not far from here). 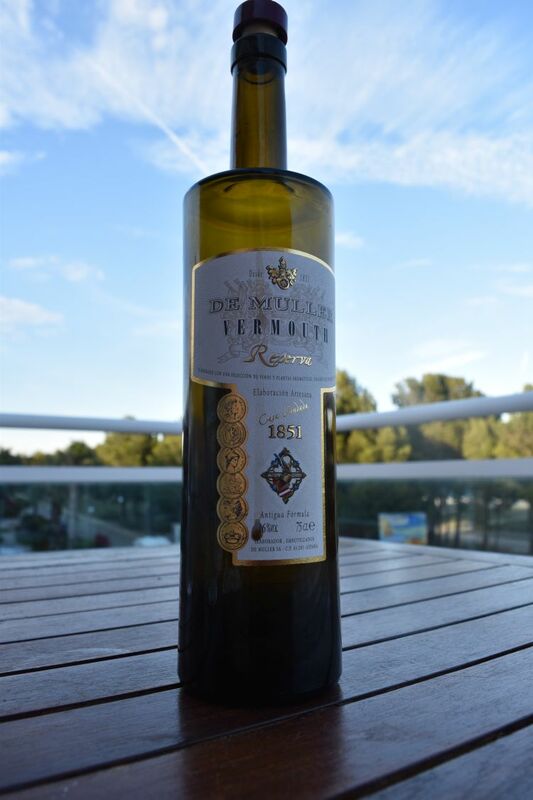 We top our meal with a sweet wine from Pellehaut (Gascogne, west of Toulouse, made out of Chardonnay and Petit Manseng; the latter can mature until December thanks to its hard skin; it is the basic ingredient of sweet wines in South West France and in North Spain). 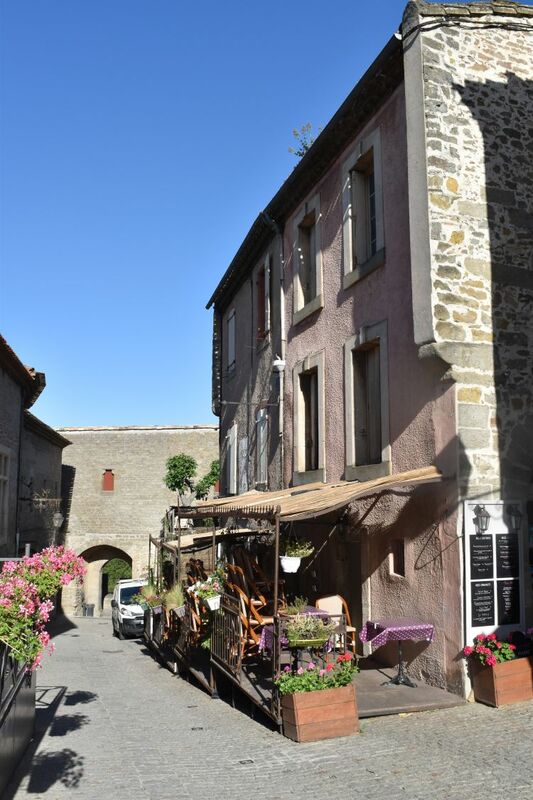 The two star Hotel and Restaurant de l’Aubrac is a great place to stay – welcoming atmosphere, great dinner, good breakfast and quiet rooms. 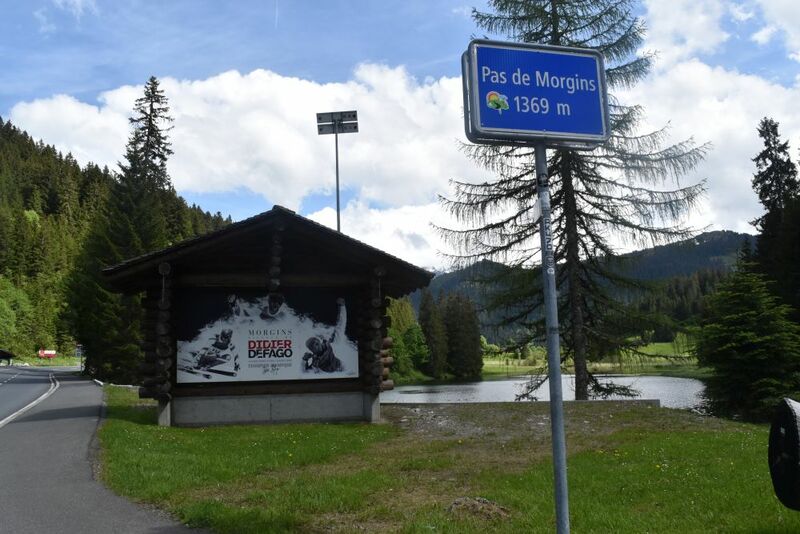 On the third day we head back to Switzerland – all on highways – and enter our country crossing the Pas de Morgins. 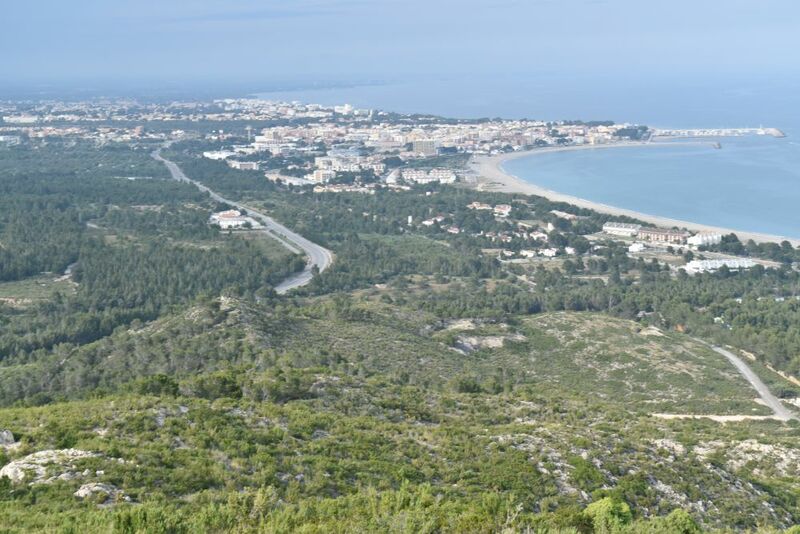 We give back the the apartment keys and thank our friends for having let us stay in their beautiful apartment in L’Hospitalet de l’Infant with its gorgeous view of the pine trees and the sea. From L’Hospitalet we drive back to Switzerland, first crossing the Pyrenees and stopping at Carcassone. 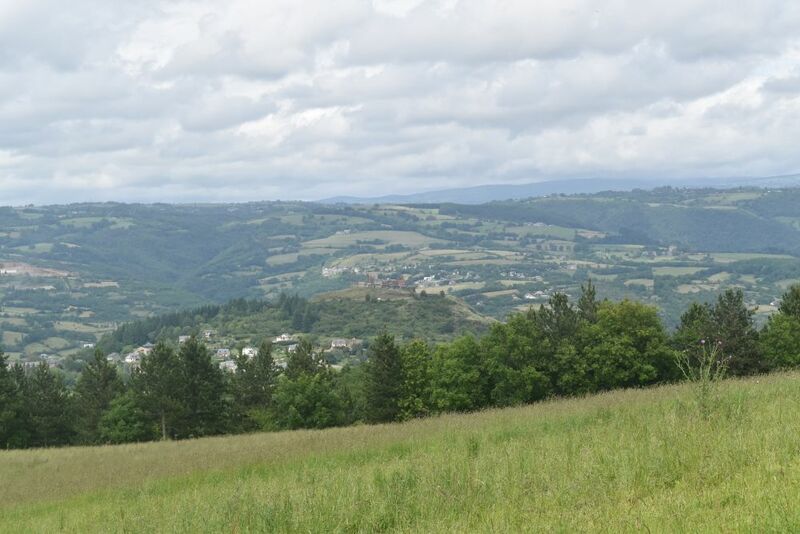 The next day we continue through the rough plateau mountains of Causses and stay overnight at Laguiole. Finally on the third day we take the French motorway end enter Switzerland crossing the Pas de Morgins. Let me start with the first segment from Spain to Carcassone. 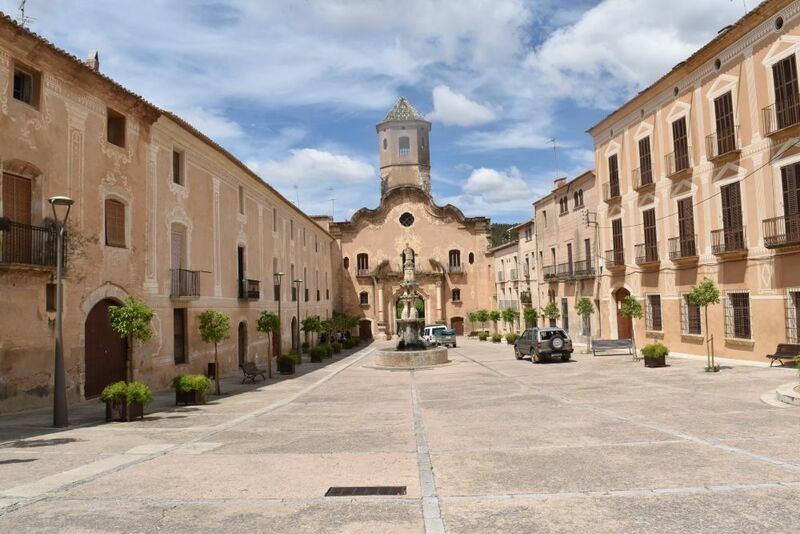 Penedès is the wine region south of Barcelona that among other things produces the well-known sparkling wine Cava. Amidst the vineyards is the monastery Santa Creuz. 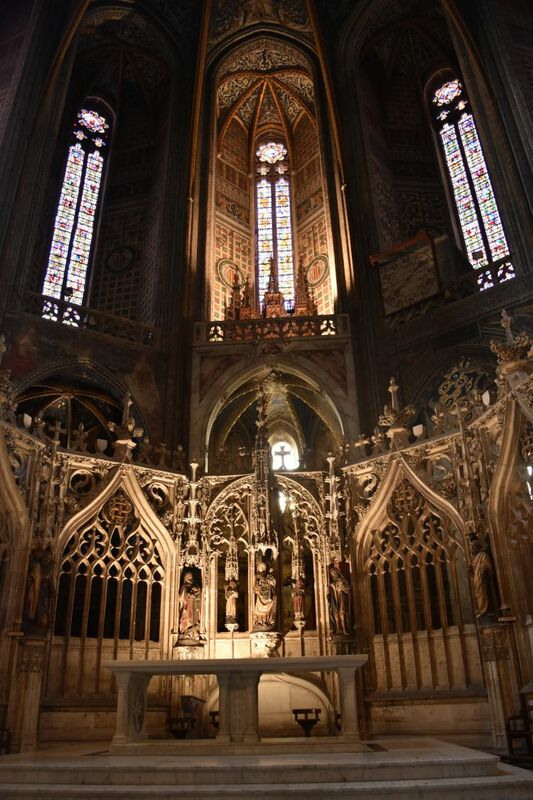 The Kings of Aragon have been buried here, until the monastery of Poblet took over. Inside the walls there is a small town. The monastery is closed at lunch time. 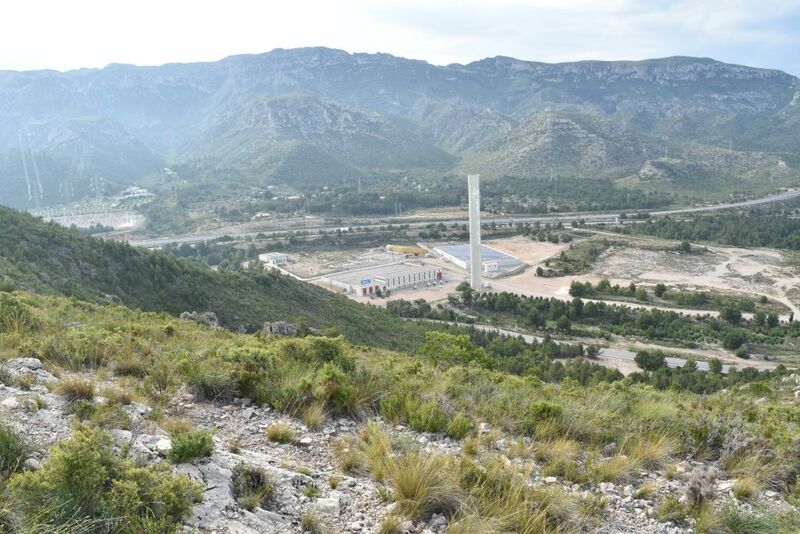 It will be on our list of excursions when coming back to L’Hospitalet. 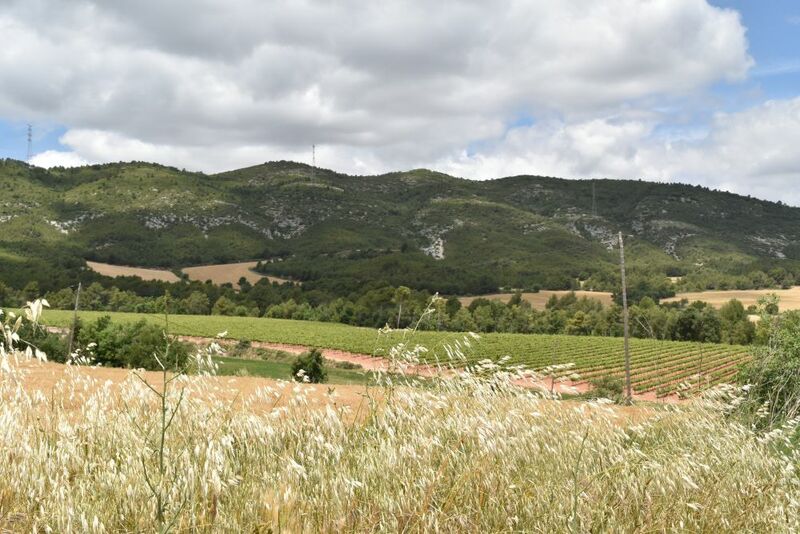 The vineyards of the Penedès are not as steep as the vineyards of Priorat. We reach the Pyrenees and drive uphill on a sinuous road. It starts to rain. 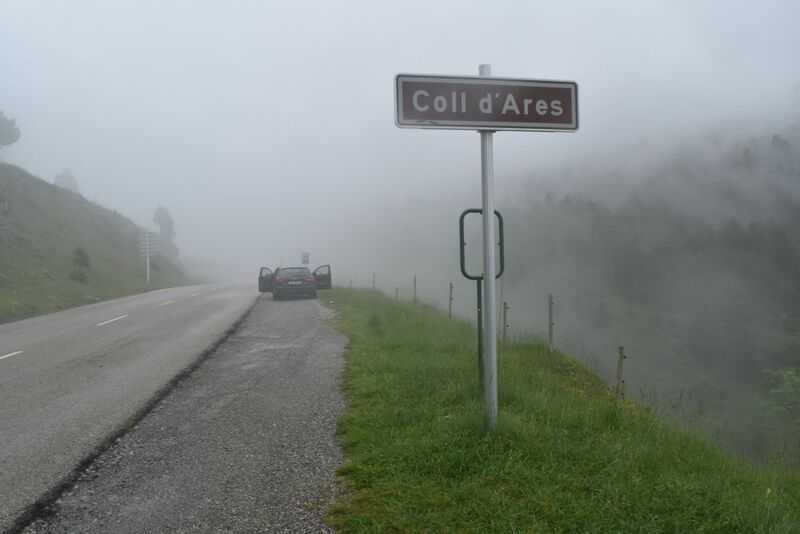 At the Coll d’Ares or Col d’Arès we cross the border to France. This sign promises great photos here. And this was the view… it WAS misty here. Above Prats-de-Mollo, Vauban (the architect of Louis XIV) has built the Fort Lagarde with the bastions typical of his strategy of defense (late 17th century). In the narrow streets the traffic halts for some time, as a lorry got stuck. All cars are waiting calmly. At Narbonne we take the motorway. Heavy wind makes the cypresses bend. We cross the vineyards of the Langedoc-Roussilon and reach gorgeous Carcassone where we stop for a night. 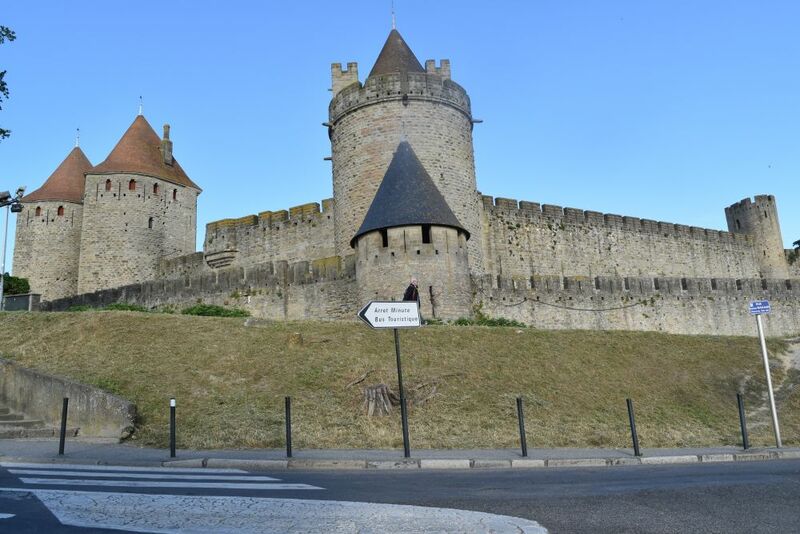 Carcassone is located in the Aude plain between the Massif Central and the Pyrenees. It was of strategic importance. The Romans had a fortification here, the Visigoths conquered it in the 5th century and the Saracens defended it successfully in the 8th century. Around 1200 the Cathars used it. In the Hundred Years War it withstood attacks by the English. Until the 17th century it was a fortress at the border between Aragon (Spain) and France, but then the Languedoc-Roussillon was transferred to France and Carcassone lost its importance as a fortress (“Carcassone – katharische Burgen”, Estel 2011). Tourists love Carcassone. Buses are allowed to to stop here for a few minutes and “download” tourists. 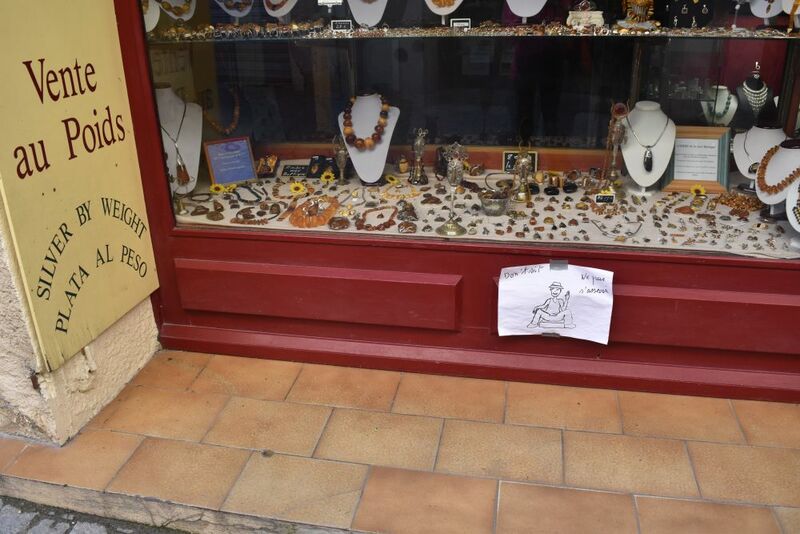 … and many, many shops invite to buy souvenirs (but not to sit down). 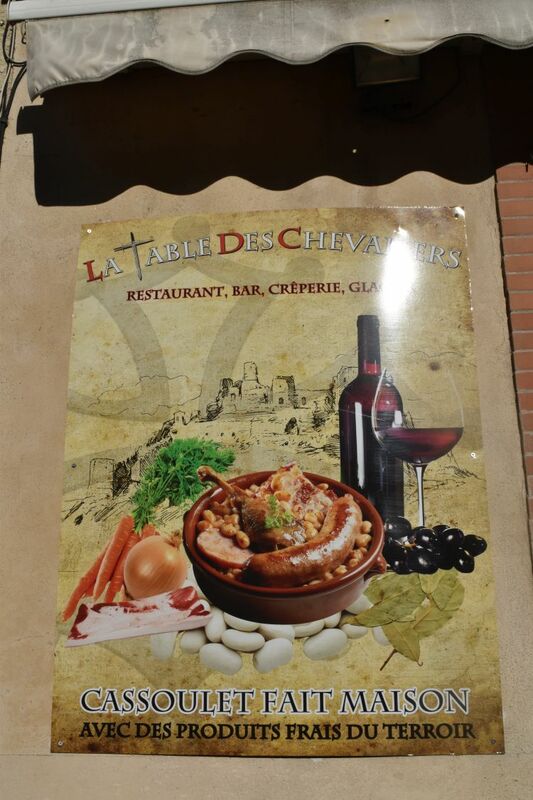 The restaurants offer home made cassoulet (fait maison). This meal is more for people who have worked in the fields all day. I prefer lamb with herbs. … and then we sleep well in our quiet hotel. Some of our days in L’Hospitalet are very quiet.We stayed “at home” shopping, swimming, reading, walking and enjoying our balcony. 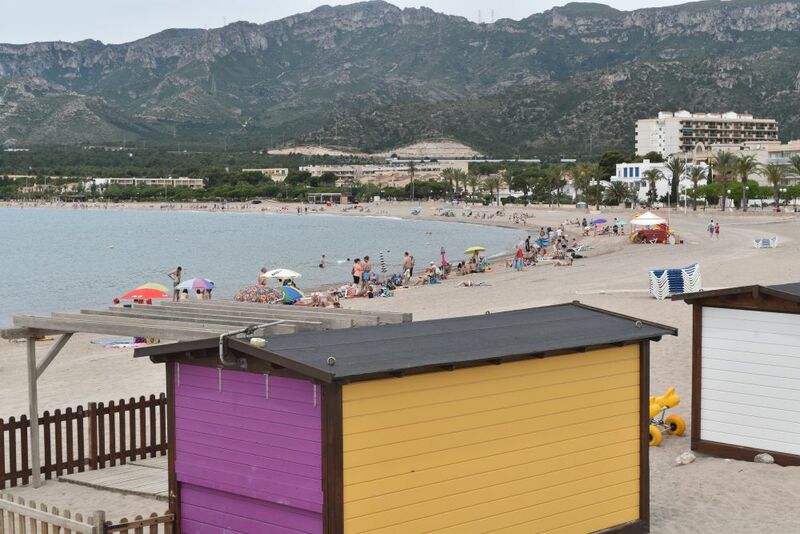 I am not a beach person… but leisure in this “off-the-beaten-tracks” village L’Hospitalet de l’Infant has its charms, especially now in early June, before the season has started off. 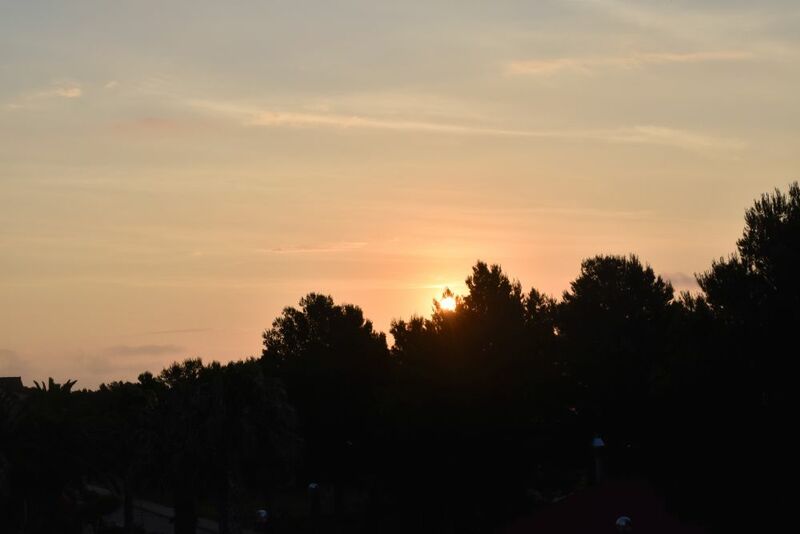 In the morning we would watch the sunrise. 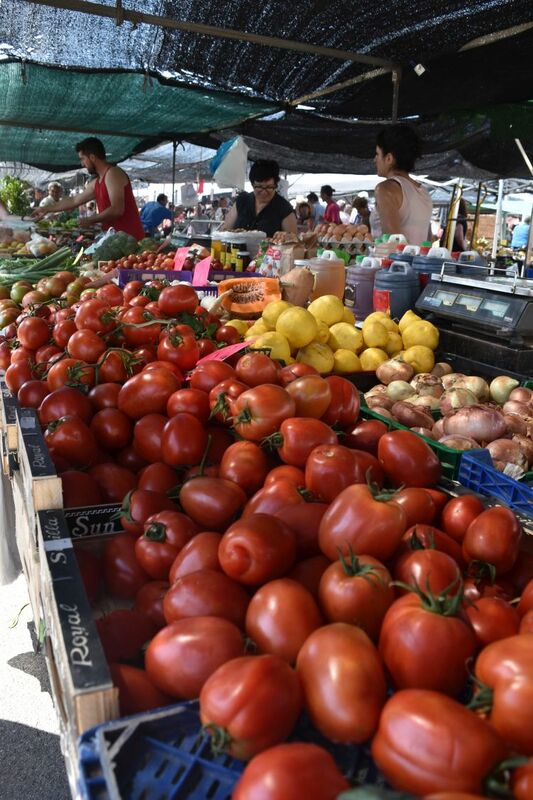 In town we would do some shopping – for instance buy fresh fruit or vegetables in the Fruites i Verduras Shop – tasty cherries and strawberries. Or we would buy fresh fish in the Peixateria. 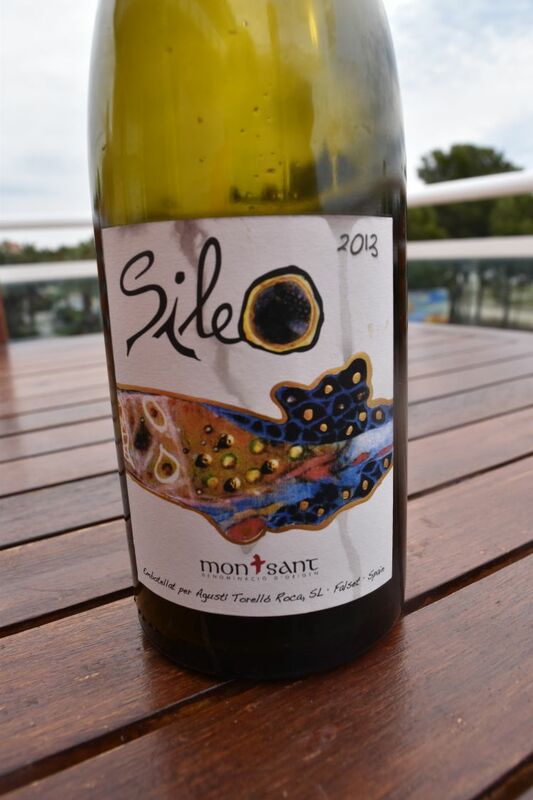 They have it from l’Ametlla de Mar, a village not far from Hospitalet. We love their codfish and sole. We prepared it just with butter and some rosemary that we had collected in the hills near Hospitalet. Delicious. The apartment house has a pool – we would swim in it, sometimes together with the first guests from Spain. One couple is from San Sebastian. Another couple has a baby. And one man has come just with his dog. 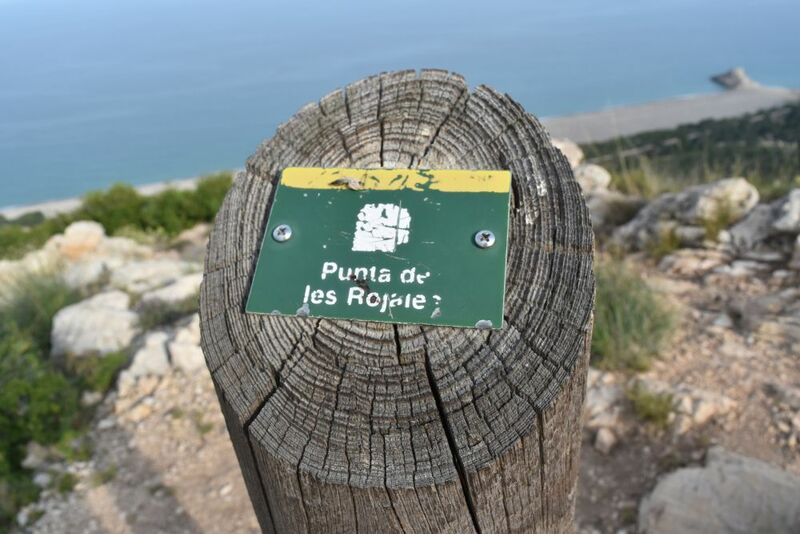 When temperatures cool down a bit in the late afternoon, we would walk along the beach line of Hospitalet or follow the GR 92 from Hospitalet to climb the hills. 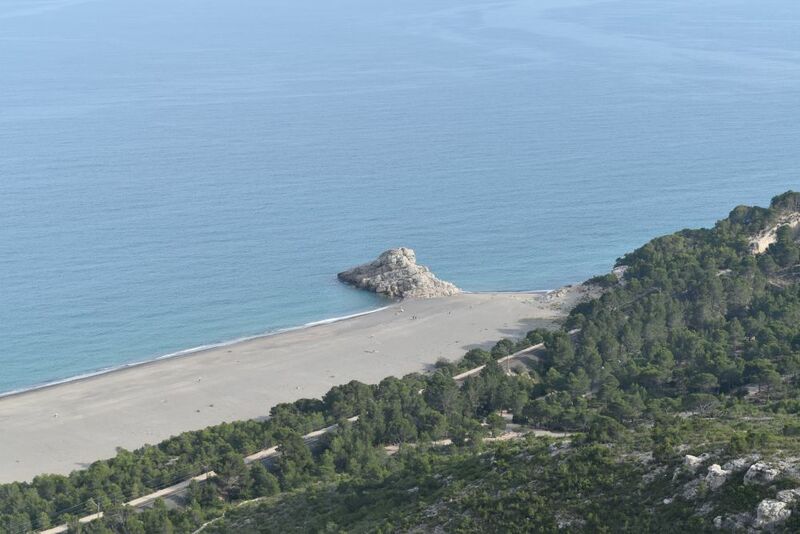 Once we visited the camping site Cala d’Oques. “Oques” is Catalan. It is the plural of “oca” which means “goose”. 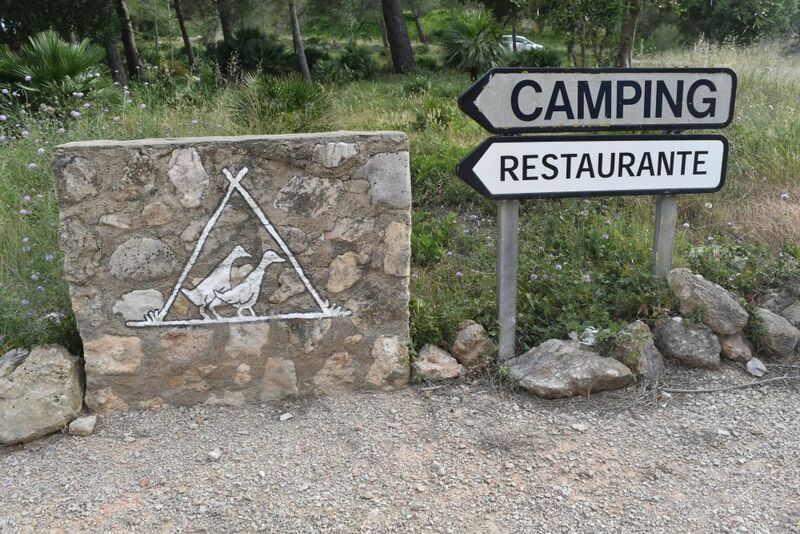 The emblem of the camping site matches its name. The small restaurant serves excellent tapas – even rated in TripAdvisor. Buen provecho. From here GR 92 leads up to the Punto de les Rojales (well marked). The landscape towards the mountains is a harsh contrast to the romantic coast line. There are motorways paralleled by well constructed roads and factories or power stations. The guests are slowly arriving in L’Hospitalet – on our second Sunday the beach was more populated than on our first Sunday, but there is still space left. The beaches and the water are clean. 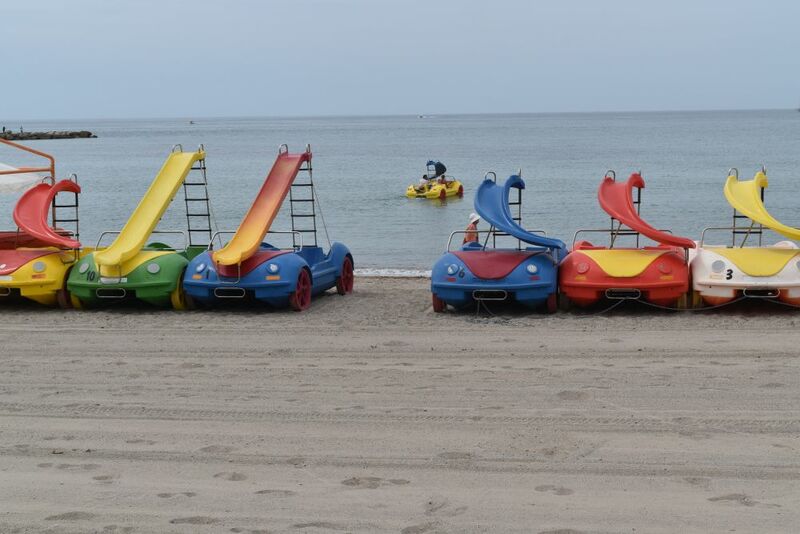 We frown at these plastic cars and find out, they are pedal boats with a slide. 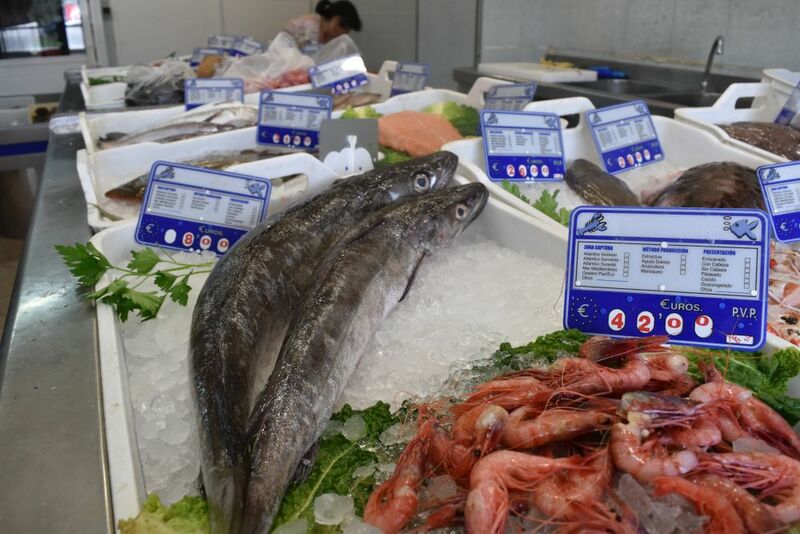 … and there are also fresh products on sale – fruit, vegetables, cheese and fish. 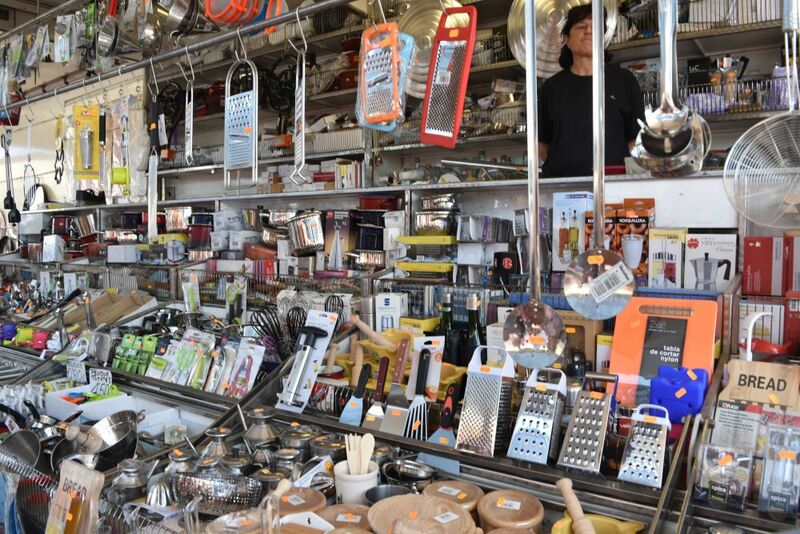 It is not just a souvenir market, but also a resource used by the locals. or a Vermouth – this is pretty common apetizer here. Yes, I am not a beach person, but leisure in this place has its charm.